(Below is a copy of an email sent to family shortly after 9/11). How are you? Glad to report that our family is still intact, however, the same can’t be said for many people in our neighborhood. Frank’s office is (or rather was) at the top of Deutsche Bank overlooking the water and the Statue of Liberty, right NEXT DOOR to the 1st building to collapse — that 2nd airplane passed 50 ft over him before hitting the South Tower. His bldg is the black glass building you can see on some news footage immediately below the plane as it hits. The first plane made such a shadow out his window, that Frank looked out the window to see what was going on, just before it impacted. Initially, he thought it hit his building. There was an explosion, his bldg shook, and he saw all the shrapnel and debris flying past his window. They began to evacuate, but then it was announced that it wasn’t Deutsche Bank – it was the World Trade Center next door that was hit, so they all went back to their offices. When the 2nd plane hit, Frank went to that side of his bldg which faces the WTC, and was pressing his face against the window glass trying to get a view of what was going on up there, but all he could see was debris raining down and smoke, etc. (His bldg is only 39 floors high and it appears the plane impacted the S. Tower around the 70th story – too high up to see from his vantage point). Finally, an announcement was made for evacuation. But some of the guys had a quick meeting to figure out who was going where, to do what, for Disaster Recovery, etc. Then they had a conference call. Nobody ever dreamt they were in such danger. Frank, one of the last to get out of the bldg., was finally heading down the stairs from the 38th floor helping an older buddy, Guy, who is handicapped/physically challenged. By the time they wound their way down the stairs floor after floor, his buddy was wheezing and puffing, and did not look well. (And later that night, Frank said to me he thinks being with Guy probably saved his life. I asked him how? Frank said at around the 35th floor, he had the thought of going back upstairs to change out of his dress shoes and into his commuting tennis shoes, but he didn’t, because he didn’t want to keep Guy waiting). Thank God these two men were together! Once Frank and Guy got down on the ground outside the building, there was blood and guts everywhere. (He saw a long piece of spine with hunk of meat attached, intestines and body parts, etc., everywhere). Cars were on fire, it was like a war zone. After a few minutes of being outside, there was a horrendous noise as the Tower began to collapse. A huge black billowing cloud of debris barreled towards them. They took off running for their lives – Frank’s Nike’s couldn’t have carried him any faster than his Florsheim shoes did on this day. But he kept glancing over his shoulder, and realized that he couldn’t outrun the approaching cloud, so he ducked into the nearest doorway — some kind of lobby. He and Guy got separated in the panic. Then the big cloud blasted by, and he said it turned black like midnight. Frank said that after 15 minutes or so of waiting for the air to clear, he came out of the lobby with his dress shirt tied around his nose and mouth like a bandana to protect his lungs. Miraculously, he saw Guy on the street once again, who didn’t recognize him because of the shirt, so Frank called to him. Frank helped Guy take off his shirt too and tied it around Guy’s face to protect him from the dusty air. Then they made their way to the Hudson River. A ferry boat was loading women and children only. When the second building collapsed, they jumped down on a loading dock platform and ducked down, pulling their shirts over their heads, while the 2nd cloud of debris blew past them overhead. Frank and Guy ended up getting a ride across the river on a Police Boat. Thanks to God, Guy happened to have his car parked on that NJ side of the river that day! They walked for awhile heading for Guy’s car, but Guy was struggling. That’s when a policeman drove up and offerred to give them a ride to Guy’s car. Frank was able to get through on the cell phone again from the car to reassure me he was okay and on his way home — which took several hours, but thank God they made it safely home. We ended up having 3 other men come over to the house, 2 of which spent the night, because they lived in Staten Island and couldn’t get home — all bridges were closed. I washed their clothes as they puffed out billows of fine dirt with every movement. Even after showering, Frank said that his hands felt like he’d been up in the attic working with fiberglass insulation. The next day, the smell in the air was such that it made them vividly remember it all over again, as the wind had shifted to blow in our direction from the City. For the past few days now, they have been working in a Deutsche Bank building Harbor Side (on the New Jersey side) — Frank is head over the Command Center, and they are busily implementing Disaster Recovery. He’s been working around the clock – he just called that he’s heading to the hotel after some 30 hours of work straight… the guys who came into work this morning to relieve him were teasing him about his red-eyed appearance. But he, and other hard-working guys like him, have Deutsche Bank ready for business Monday morning when the stock market and bank open again for trading. Deutsche Bank’s building at 130 Liberty Street is a total loss. The newspapers say the top floors are missing and the building is badly burned. The window through which Frank was trying to look out to investigate what was going on minutes before the collapse, and that whole side of the building, had been peeled away. It supposedly has been blown off its foundation and may collapse or be demolished to avoid further injuries to the rescuers. But there is love, too. People are rallying around to help each other. I have received calls and e-mails from around the world with love and support. Even our pharmacist was so helpful when I explained to him that Guy had a heart condition and was missing his daily dose of heart medication — our pharmacist gave me a pill, free. The whole neighborhood took Karen Cangialosi food and cards and flowers to her house, trying to outreach to her – all stood on her front lawn holding candles singing “God Bless America”. But I’m sure she only wants her husband back. PS – A sad footnote – Guy, the gentleman who Frank helped down the stairs on 9/11, died of a massive heart attack while at work on January 6th, 2002. PSS – In May of 2002, Deutsche Bank had a 10,000-man reduction, and Frank was laid-off. Unemployment was dragging on month after month. Nobody wanted to hire a Director with the economy in such bad shape. And, they wouldn’t hire him for lesser-paying positions, because they know he’s a Director, and he’ll leave once the economy turns around (which is true)…More layoffs happened every day. So after watching our nestegg begin to melt away, we decided we needed to do something with the remainder of our money, and buy a business or something, before we started eating away at the equity in our house. So, long-story-short, we saw Mockingbird Bay Resort on the Internet; Frank drove out to Arkansas to see it; we sold our house in New Jersey ourselves in July 2003; and on October 23rd, 2003, we bought Mockingbird Bay Resort! As an added bonus, Frank’s parents now live in Mountain Home, and now my parents, who retired from S. Cal, live just down the road from the resort. We love our new life here! We feel the Lord has lead us to this very special place. 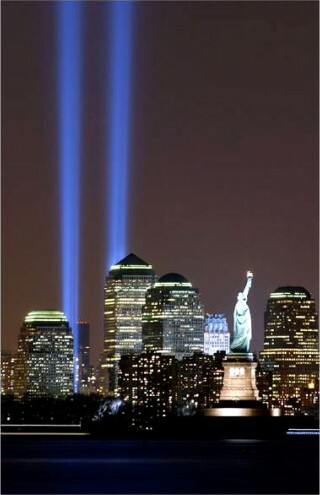 9-11 shifted our priorities, and we realize more than ever the importance of family and enjoying life. We are grateful for every beautiful sunrise we watch come up over the lake, and pinch ourselves to see if this new life is real. They say diamonds are forged from a lot of pressure and heat – well, Mockingbird Bay Resort is our diamond that, without all the stress and pressure, and difficulties of the past couple of years, we never would have found. All things happen for a reason. Remember, God will turn a bad situation around and make it good. The Baxter Bulletin did an article on Frank — he’s shown here talking about the event while looking through a commemorative book about 9-11. It shows a family portrait, which was the only thing salvaged from Frank’s office, put through decontamination, and given to Frank — serves as a reminder of that life-changing day. Sorry for the long story…but that’s how we got here. A wow story indeed. Your family was certainly meant to be where you all now are. In the early months of 2003 my Family also decided that the Mockingbird Bay Resort was where we needed to be. But, well you know what happened. God has blessed you with an awesome new run at life with Mockingbird Bay. Wow, really?! That is amazing! I have talked to a few people on the phone over the years who tell me that they were hoping to buy Mockingbird Bay — and now they keep an eye on our website with a soft spot in their hearts for it. I’m glad we were the lucky ones who finally made it here — as it is a lovely place. Sorry to those who had to find something else… Where did your family ultimately end up? Another resort? You’re always welcome to visit! 🙂 We have cabins! Frank and Loretta, You really have an inspiring story. After talking with you yesterday, I wanted to know more and was delighted to find your 911 story online. Your resilience is amazing. Not only has it provided a beautiful home and new life for your family, it also keeps giving to others, creating great memories for those who visit your beautiful Mockingbird Bay Resort. We’re very happy you decided to make your home on Norfork Lake. Your family is an exceptional addition to the Mountain Home community. This is a great story Loretta – I think of it often. Amazing the paths our lives take.